to show off the natural landscape and rugged seas of Tasmania. The event is enjoyed by all who compete in it. Just one yacht still has to finish the final sailing leg of the marathon Australian Three Peaks Race,their crew this morning forced to row towards Hobart on a windless River Derwent. Of the 13 multihill and monohull yachts that started from Beauty Point on the Tamar River on Good Friday, seven have finished the Race around the spectacular Tasmanian north-east and east coast, comprising three sailing legs totalling 335 nautical miles and three mountain runs totalling 131km with mountain climbs totalling 2646 metres. Two boats have retired from what is described as Australia's ultimate endurance event. 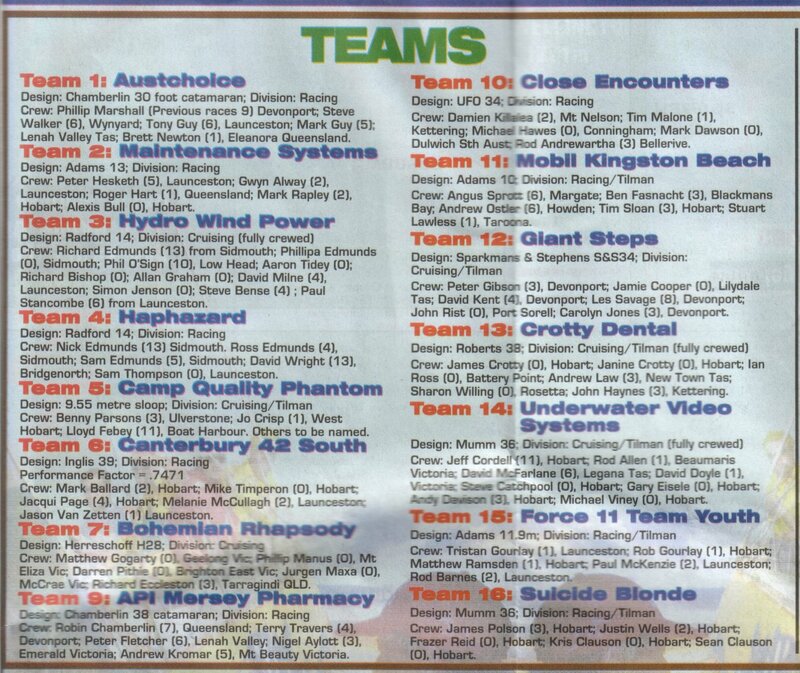 Three teams of runners are on the mountain, including four of the crew of Club Marine Team Youth, three of the crew of Scotch Oakburn College, and four of the crew of Camp Quality, competing for the coveted Tillman Trophy and the Cruising Division. women, Jo Crisp and Caroline Lynch, set off the mountain run at 7.32 this morning. They will head off at 2 pm on Good Friday. Harvey Griggs,John Poynter and Bruce Nye. Sam's Sails,Shades and Canvas at Invermay. record-holder,the monohull Southern Cross, and another catamaran, Sea to Summit. Another significant trophy, the King of the Mountains, will not be decided until the last boat, the trimaran Rosevears Tavern,reaches Hobart's Sullivan Cove and the runners complete the 33 km climb to the peak of Mt Wellington and back. The King of the Mountains is for the fastest team on all three mountain legs - to Mt Strzelecki on Flinders Island, Mt Freycinet on the Tasmanian East Coast and Mt Wellington in Hobart. Although their boat has not sailed so well, the Rosevears Tavern runners, Phil Tuck and Rod Barnes, both from Launceston,have been the fastest on the first two legs. fastest time so far overnight being 2 hours 39 minutes. on the Tamar River, at 9.24.03 am, followed by the Hobart catamaran, Sea to Summit, skippered by Richard Clennett, and Haphazard, Richard Edmunds' Radford 15m, at 1.59.27 pm.